It’s spring, which means unpredictable weather, buckets of rain, and those spring respiratory sicknesses we all know and love. April showers may bring May flowers, but they also bring a host of respiratory problems…any of which can lead to a sore throat. Sore throats are one of the most common spring ailments, and especially common in kids. 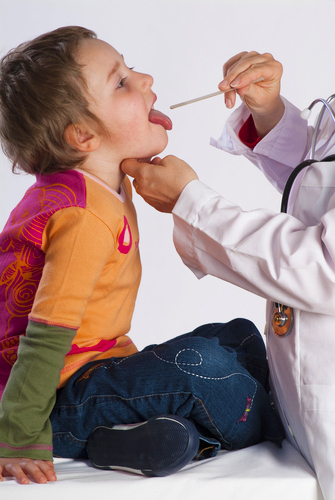 If you have a child between the ages of 5 and 15 years old, you may also be at increased risk for strep throat. Strep is fairly common among children in the spring and fall, and is spread through airborne germs (think sneezing or coughing). Until all children everywhere stop using their sleeves as hankies, parents should know the difference between strep throat, which is a bacterial infection, and the more common, viral sore throat. A viral sore throat will go away on its own, but strep is caused by the streptococcal bacteria and requires antibiotics to treat. So what are the warning signs of strep? If you are experiencing these symptoms, or your child is complaining of a sore throat that just won’t quit, call the NYC ear nose and throat doctor, Dr. Robert Pincus. You can expect your child back in the playground in no time!